Camellia sinensis is the botanical name for the tea plant, from which teas such as black, green, white, oolong, purple, and pu-erh teas are produced. A cousin of the garden camellia, camellia sinensis is an evergreen shrub that thrives in tropical and subtropical climates, and has been cultivated in order to produce tea for hundreds of years. The tea plant come in two main varieties, each of which are slightly different in size, growing location, and flavor. Camellia sinensis var. assamica is cultivated most often in India, particularly the Assam region, from which it gets its name. Most black teas are made from camellia sinensis var. assamica, as well as many pu-erh teas and some oolongs. This variety of camellia sinensis is larger and more robust, producing teas with a heartier flavor. Camellia sinensis var. sinensis is the other most common variety of the tea plant, from which green, white, and some oolong teas are often produced. This variety is native to China (sinensis is Latin for “from China”) and is typically smaller and more delicate, resulting in mellower teas. Tea has been cultivated and consumed for hundreds of years. Archeological research even indicates that tea may have been drunk over two thousand years ago! Originating in southwest China and northeast India, camellia sinensis has a rich history and cultural significance in many countries all over the globe. Today, tea is mainly grown in places like China, India, Japan, Nepal, and Vietnam, as well as several other south and east Asian countries. With proper cultivation methods, however, tea can and is grown in a wide variety of locales, from Kenya to Hawaii and many places in between. While all true teas are produced from camellia sinensis, the ways in which teas are processed results in many different varieties of tea, such as black, green, white, oolong, purple, and pu-erh. Some factors that go into producing different kinds of tea include oxidation level and processing techniques such as steaming, firing, rolling, and aging. Other circumstances that contribute to different varieties of tea include the use of specific cultivars and the terroir in which tea is grown. All tea made from camellia sinensis contains some amount of caffeine, making it a popular choice for a warming, uplifting morning drink. While black and pu-erh teas contain the highest amount of caffeine, other varieties such as white and purple teas contain relatively low amounts. Tea is also extremely high in antioxidants, and is rich with numerous other health benefits. In addition to these positive effects, the act of brewing up a cup can be a soothing and meditative process. No matter what kind of tea you prefer, tea can be a great way to take a pause in a busy day and enjoy a delicious cup with a rich history! Whether you’re looking for a little boost in the morning, or are trying to steer clear of caffeine entirely, it’s always important to consider the caffeine content when selecting a tea. Many people looking for an alternative to coffee turn to tea to provide a milder morning pick-me-up that still contains some caffeine. With about half the caffeine of a cup of a coffee, black teas can be a great choice for a delicious, stimulating brew. Other types of tea, including green, white, oolong, pu-erh, and purple, also contain varying levels of caffeine, while herbal and rooibos teas contain none. Here at ArtfulTea, we carry teas with a wide range of caffeine levels, from hearty Indian blacks to caffeine-free tisanes and everywhere in between! Caffeine can be a potent stimulant, with both positive and negative potential side effects. Many people rely on caffeine to jump-start their morning, and caffeine can be a great way to give your body a little energy boost and to increase mental alertness and physical stamina. It’s important to keep in mind that people can have very different reactions to caffeine, with some able to tolerate very high amounts, and others able to tolerate very little, if any, caffeine. While everybody’s different, it’s a good idea to steer clear of caffeine in the evening so that you don’t disrupt your sleep, and to be careful when drinking caffeinated tea on an empty stomach. Many people are familiar with the increased heart rate and jittery feeling that comes with consuming too much caffeine, but even if you don’t experience any adverse side effects, it’s always best to practice moderation! For those who want to keep their caffeine intake to a minimum, there are plenty of herbal options. While all teas that come from the camellia sinensis plant do contain some amount of caffeine, herbal and rooibos tisanes are a great alternative! Black teas contain a moderate amount of caffeine, about half that of a cup of coffee. Indian black teas like Assam and Nilgiri, as well as hearty breakfast blends like Irish Breakfast and English Breakfast, contain the highest amount of caffeine. Chinese black teas like China Keemun and Lapsang Souchong, meanwhile, contain slightly less caffeine and are a bit mellower. Flavored black teas also contain slightly less caffeine, since additional ingredients are blended with the tea and somewhat dilute the caffeine content. Pu-erh teas also contain a moderate amount of caffeine, similar to that of black teas. These aged, fermented teas, while stimulating, have a rich, earthy flavor with less acidity and tannic bite than black teas. Oolong teas can range in their caffeine content, depending on their oxidation level and how they are processed. Heavily oxidized oolongs have a caffeine content similar to that of black tea, while oolongs that have undergone less oxidation have a caffeine content similar to that of green teas. Green Tea is lower in caffeine, about half that of black tea and a quarter that of a cup of coffee. Matcha, made from powdered green tea, has a higher caffeine level, similar to that of black tea, because it’s more concentrated. White and Purple teas generally have the lowest amount of caffeine, and are also very high in antioxidants, making them a great choice for those looking for only a little bit of caffeine but a lot of health benefits! Mate, although not produced from the tea plant camellia sinensis, is high in caffeine, containing almost as much as coffee per cup. Sometimes called mateine, the kind of caffeine contained in mate is said to contribute to focus, clarity, and alertness, without the jitters that come from drinking too much coffee, making it a great alternative for those looking for a stimulant with fewer adverse side effects. It is traditionally drunk out of a hollow gourd through a straw known as a bombilla, but can also be prepared in the same way as other teas and tisanes. Herbal and Rooibos tisanes, meanwhile, are naturally caffeine-free. These blends can be a wonderful alternative to traditional teas for those looking to avoid caffeine entirely, as well as a great option to enjoy in the afternoon and evening. Whether you’re looking for a hearty, highly caffeinated morning cup or are interested in skipping caffeine altogether, there are a wide variety of teas to choose from. Whatever sort of tea you’re in the mood for, here at ArtfulTea we’re sure to have the perfect cup! Oxidation is a process through which tea leaves are exposed to the air in order to dry and darken, contributing to the flavor, aroma, and strength of different teas. Just as other fruits and plants, like apples or avocados, brown when exposed to oxygen, tea leaves go through a similar process after they are harvested. As tea leaves are oxidized, they undergo unique changes that influence their chemical composition. This is a key step in processing tea, with different levels of oxidation results in different varieties, including black, green, white, and oolong. While it’s common for people to use the terms oxidation and fermentation interchangeably, they’re actually different processes. Fermentation involves microbial activity and refers to the process undergone by aged teas such as pu-erh. Oxidation, meanwhile, refers to the process of exposing tea leaves to oxygen in order to dry and darken them. Many types of tea undergo some form of oxidation, most notably black and oolong teas. Different kinds of tea have different levels of oxidation, resulting in a wide variety of appearances and flavor profiles. Tea leaves begin to oxidize as soon as they are plucked, and the level of oxidation is a key factor in tea processing that results in different categories of tea. Black teas are fully oxidized, resulting in a dark, rich cup of tea that is high in caffeine. Oolong teas are partially oxidized, and their oxidation level can vary widely between that of black and green teas. Green teas are largely unoxidized, and undergo a firing or steaming process, sometimes known as “killing the green,” soon after harvesting in order to halt oxidation, resulting in a lighter, more mellow cup of tea. White teas, because of their minimal processing, undergo a small amount of oxidization as they dry. While all teas are made from the same plant, camellia sinensis, oxidation is largely responsible for the differences between different types of tea. In general, the longer tea leaves are allowed to oxidize, the darker and stronger the tea made from those leaves will be! In order to preserve the freshness and flavor of loose leaf tea, it’s important to store it correctly! Tea is susceptible to air, moisture, light and heat, and if exposed to any of these elements for even a fairly short time, tea will begin to degrade. The most effective way to keep your tea fresh is to use a storage container that is opaque and tightly sealed. Tea tins are an ideal way to store tea for this reason. Glass containers, like mason jars, should only be used if the tea is stored in a dark drawer or cabinet. In general, tea keeps best when stored in a cool, dark place away from any direct source of heat or light. Here at ArtfulTea, we carefully package our teas by hand in bags and tins. Our bags are specially made to keep out moisture, air, and light, and will keep tea fresh for up to three months. While our tins cost $3 more, they keep tea fresh for up to a year! We recommend first purchasing tea in a tin, and choosing bags when reordering in order to decant into the original tin. If you’re local to Santa Fe, you can bring your tin back to our store and we’ll refill it for the price of a bag! Not sure if your tea is still fresh? While teas rarely go bad, they do lose their flavor over time, especially if stored improperly. It’s a good idea to evaluate the aroma and flavor of teas you think might be over a year old, and to replace them with fresh tea if necessary. After all, life’s too short to drink bad tea! Many people are first introduced to tea drinking via teabags. They’re quick, they’re easy, and you can find them in the grocery store! While teabags can be a great way to learn more about tea as a beginner, loose leaf tea is almost always superior in taste. Teabags are usually made from tea “dust,” small particles of low-quality tea that are inexpensive and easily available. In contrast, loose leaf tea is made from whole leaves of tea, which are of a much better quality and brew up a cup with a much more nuanced flavor. At ArtfulTea, our loose leaf teas and ingredients are all carefully sourced, resulting in premium teas that don’t sacrifice on flavor, while still being affordable enough for everyday enjoyment. Most teabags are packed tight, allowing little room for the tea to expand and release its flavor as it steeps. Loose leaf teas, when properly prepared, have plenty of room to expand and result in a lovely, flavorful cup. Because they’re made of higher quality tea leaves, loose leaf teas typically take a bit longer to brew, but it’s a pleasure to watch the leaves slowly unfurl! There are certainly many different varieties of teabags out there, but the options are endless when it comes to loose leaf tea. At Artful Tea, we carry almost a hundred different varieties of tea, and are continually expanding in order to carry even more. While it can be hard to find certain kinds of tea in teabags, ArtfulTea carries the full range of teas, from popular breakfast teas like Irish and English Breakfast, to lesser-known teas like Purple and Pu-erh. Interested in trying loose leaf tea but not sure where to start? 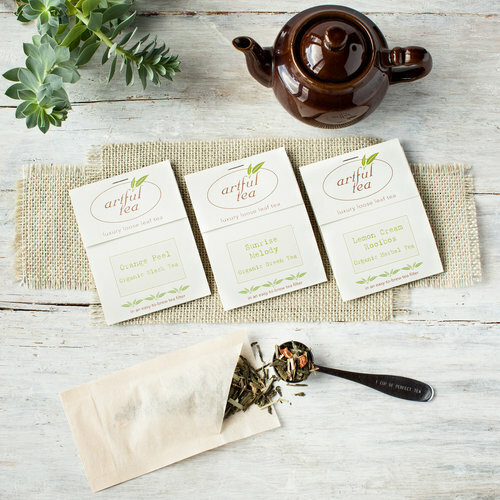 ArtfulTea offers a variety of sampler packs for those curious about trying loose tea for the first time, or simply experimenting with different flavors. While these teas come carefully prepackaged in handmade teabags, they contain only the highest quality loose leaf tea, making them a great way to transition from store-bought bags. We offer samples in packs of six and packs of twenty. Interested in making homemade teabags yourself? We also sell tea filters that can be used with any variety of loose leaf tea - simply spoon the tea into the bag, then follow our tea preparation instructions for a delicious cup of tea. Want to dive right in to the world of loose leaf tea? We also offer both six month and twelve month customized tea subscription boxes! Whether you’re new to the tea world in general or are a longtime tea drinker, loose leaf teas can be a great way to further develop your love of tea and explore all that teas have to offer. At ArtfulTea, we are proud to sell only the highest quality loose leaf tea! Proper preparation is the key to a lovely tasting cup of tea. While personal preference plays a role in how strong you like your tea, there are a few factors that are important to take into consideration when brewing up a cup. The amount of tea leaves you use to brew can have a significant impact on the strength and flavor of the prepared tea. The ratio of tea leaves to water varies depending on the tea, with less dense tea like white tea and herbal infusions generally requiring more leaves, and denser teas like black and green requiring less. For a standard 12 ounce mug, just double the amount of leaves recommended for a 6 ounce cup. If you're using a teapot, it's a good idea to measure how many ounces it holds. Not sure if you’re measuring tea correctly? Our stainless steel measuring spoons are exactly one teaspoon, and make tea preparation a breeze. Water temperature also plays an important role in tea preparation. For more delicate teas such as whites and greens, water that is too hot may burn the leaves and result in an unpleasantly bitter cup. For black and herbal teas, on the other hand, a roiling boil helps to unlock the flavor of teas and allows them to fully steep. At ArtfulTea, we use an electric kettle to heat water to a precise temperature, but traditional electric and stovetop kettles work fine as well. For teas that require boiling water or a 212 degree temperature, it might be necessary to use a lower temperature depending on the altitude. (Here in Santa Fe, we can’t reach 212 degrees due to the elevation!) It’s also important to use the best quality water available, and to always start with fresh water. Steeping tea for too long often results in an unpleasant bitter taste, while steeping for too short a time results in a weaker, less flavorful cup. How long teas should be steeped varies widely: herbal infusions and rooibos teas can be steeped for over ten minutes for a stronger flavor, while some green teas should only be steeped for a minute before they become bitter. We recommend using a tea timer for ease and accuracy. When steeping, it’s important to give the tea leaves room to expand as they steep in order to fully release their flavor. Tea infusers and filters are a great way to ensure that your tea has room to steep properly. While tea preparation is to some extent a matter of personal preference, here are our recommendations for ensuring a perfectly brewed cup. Feel free to tweak them to make a cup of tea that best suits you! When purchasing loose leaf tea, many of our customers ask us for advice about the best pots, cups, and accessories for brewing tea. While personal preference plays a large role in deciding how to prepare your tea, the type of tea, traditional preparation methods, and aesthetic considerations can all be taken into account in order to ensure that you brew up the perfect cup! Making tea just for yourself and not sure where to start? Artful tea sells a variety of filters and infusers that make preparing a cup of tea a breeze. Simple set the filter or strainer in your favorite mug, fill it with tea, steep for the appropriate length of time, and enjoy. All-in-one tea cups with infuser and lid are another great option for single cups! If you’d prefer more than one cup, teapots come in a wide range of shapes, sizes, and colors, and can be a lovely way to enjoy successive cups of tea. We recommend teapots that come with their own built-in infuser baskets, which make tea preparation, steeping, and straining an easy, seamless process. Interested in preparing tea in a more traditional way? At our Santa Fe location, we sell a variety of beautiful teapots and sets. These tea accessories have rich histories in their countries of origin, and are often specially crafted to be used with particular types of tea. Our Yixing teapots, from the pottery capital of China, are made from clay rich in minerals which produce a variety of beautiful colors when fired. Teapots from Yixing have long been considered the best tea-brewing vessels in the world and, with use, each pot develops a rich patina which enhances the taste, color and aroma of fine teas. Yixing pots are used in Chinese Gongfu tea preparation, where tea leaves are steeped in multiple successive infusions, and are most often used with Chinese black, pu-erh, and oolong teas. Gaiwans are another traditional way to brew Chinese green and white teas, and can be made out of porcelain, glass, Yixing clay, or even jade. Japanese teas, on the other hand, are often traditionally brewed in tetsubin, or cast iron teapots, which come in a variety of shapes and colors, as well as small side-handle pots sometimes called kyusu, which are often used for preparing sencha and other high quality green teas. We also sell a variety of western-style ceramic and glass teapots, which are perfect for brewing up a strong pot of black tea or preparing an herbal infusion. Tea sets, complete with pot, cups and saucers, creamer, and sugar jar can be a lovely way to coordinate your tea time and cultivate an aesthetic that’s all your own. Looking to take your tea with you? One popular option are our Urban Tumblers, which are made of borosilicate glass, stainless steel and natural cork, and have lids that unscrew from both ends. The bottom has a removable stainless steel infuser basket for tea leaves, and the tumblers can be used for both hot and cold infusions! However you decide to brew your tea, the sky’s the limit in terms of teapot possibilities, and choosing what method works for you can be a great way to cultivate your own particular tea aesthetic. You can watch your tea leaves unfurl as they steep in clear glass, prepare tea in a traditional pot perfected over the course of centuries, or choose a color or pattern that best suits your style. Different teapots, cups, and other accessories can be used to satisfy different brewing needs or moods! No matter what method you use, you’ll have the most important result: a perfectly brewed cup of tea!